Home » Specialty Appliances » Which is the Most Accurate Food Scale? Which is the Most Accurate Food Scale? A kitchen scale comes in useful when you want to bake or if you’re watching what you eat. Its capacity and yielding an accurate and steady reading are the most fundamental features of any kitchen scale. While any old food scale will do for measuring weight for normal cooking, accuracy is imperative if you want the perfect cake or cup of pour over coffee. It’s easy to find a scale that measures in increments of 5 or 10 grams, but that is not ideal for many tasks. 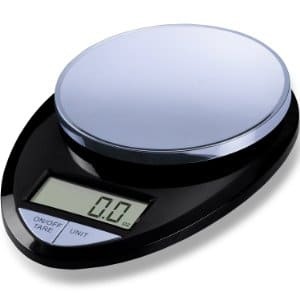 Most scales that are used for weighing large quantities or heavy items aren’t more accurate than that, so it really comes down to finding the most accurate food scale that can also handle a reasonable maximum weight. You should ideally get the best digital kitchen scale that can measure in increments of 1 gram (0.05 ounces) or less. Most scales for home use are battery operated so they can suddenly stop working when least expected. Unless you always have a spare battery around, you should consider getting one that also comes with an AC adapter. Let’s take a look at the best food scales available today that are known to be pretty accurate. If you’d rather have a wider choice, Amazon is the best place to look. You may also want your scale to do more than just measure the weight of ingredients, in which case, take a look at the interactive connected Drop Kitchen Scale. With this scale, you can rest assured that your kitchen weighing needs will be met. Designed and manufactured to the highest quality specifications, the EatSmart Precision Pro is an easy to use, lightweight, and durable kitchen scale capable of weighing food items up to 11 pounds, which is more than enough capacity for an average meal. An useful feature of this scale is that it can show the weight of your food in ounces, pounds, grams, and kilos. The scale can measure weight increments of as low as 1 gram or 0.05 ounces and comes with a tare function that lets you discount the weight of the container that’s holding the food. In terms of design, the Precision Pro is aesthetically pleasing, compact, and lightweight for easy transfer. The scale’s weighing platform measures just under 20 square inches, which is more than adequate to weigh recipes for a homemade meal. Below the scale are rubber feet that prevents the scale from sliding while in use. Another feature of the EatSmart Precision Pro Scale is that it has a 3-minute auto-shutdown feature that allows the unit to save on power. In addition, the scale comes with a free calorie factors guide, which is perfect for individuals conscious about their calorie intake. Besides being surprisingly small, lightweight, and easy to use, the EatSmart Precision Pro Digital Kitchen Scale is low priced ($30-40) and looks fancier than the price. You can even get this in a few different colors and finishes. The scale also generates accurate measurements. Although this scale works perfectly well for most people, some customers are concerned about its plastic design, which appears slightly flimsy. When you first look at the KD8000 Scale, you think of something vintage. But do not be fooled by its look, this unit is modern, digital, and made of stainless steel. Since it’s an upgrade from the previous KD7000, the KD8000 has a few cool tweaks that make it stand out in its class. The KD8000 by My Weigh features a fresh baker’s percentage weighing function that allows bakers to weigh ingredients in proportion to the principal part of a recipe. This function paired with its 17 pounds capacity makes it simple to resize recipes according to the percentage and makes bulk baking a piece of cake. The unit also comes with a protective gunk shield, programmable auto-off feature, tare button, a hold feature, and a fancy backlit display. The protective gunk shield covers the display and the buttons in case of any spills. The programmable auto-off feature allows your scale to automatically turn off after a few seconds of inactivity, saving on batteries. Because of the hold feature, removing your item from the scale does not affect the initial scale reading when you turn it back on. A significant improvement, bearing in mind that you would have to scroll through four units each time you have to weigh. Powered by 3 AA batteries, the unit features a fancy backlit display that allows you to see the readings even in dim light. But what is most amazing is the KD8000 has a thirty years warranty period. Well, that is a lifetime; bearing in mind that the unit goes for less than $35. The scale is of good quality, size, accurate, and moderately priced. The stainless steel platform together with the protective shield makes it easy to clean and perfect for kitchen use. Also, the 17 pounds capacity allows for a large mixing bowl to be tared when weighing a significant volume of multiple ingredients. Most customers positively reviewed the KD8000, but the only consistent complaint is the issue of product support. Designed with high precision GFX sensors, a tempered glass surface and sophisticated touch-sensitive buttons, the 18-lbs Ozeri Touch II Digital scale is the industry’s most technologically superior digital kitchen scale available. This edition of the Ozeri Touch II features a stylish black surface made from the finest quality of tempered glass, which is four times tougher than regular glass. This makes it sturdy enough to handle a capacity of up to 18 lbs. The scale provides measurements in graduations of 1 gm or 0.05 oz that are displayed on its backlit LCD screen. The GFX sensors deliver higher accuracy and quick responses for the fast-paced chef. The scale also features a tare button that automatically subtracts the weight of the container to compute the weight of the ingredients being weighed. The scale is designed to display results in both US and international metric systems, however, it displays only whole numbers, no decimals. The Ozeri Touch II technology also includes a unique lifetime antimicrobial protection feature that prevents the growth of stain causing bacteria, odors, and product deterioration. The scale is about the size of an iPad and is therefore easy to move around in the kitchen. The Ozeri Touch II comes with a calorie guide book. Although listed at around $60, this unit can be found for between $20-30. This scale combines some of the most incredible functions required for a baking scale. Its accuracy is an amazing 0.5 grams. The Jennings CJ4000 comes with an AC adapter as well as batteries, an auto-off function, a tare function, and a bright orange backlight that stays on so long as the scale is active. The Jennings CJ4000 has a tallying feature for calculating huge quantities of small individual items in grams, ounces and pounds. With a capacity of 8.8 pounds, the scale is capable of pour-overs and can handle big batches of dough. In addition, the scale has one of the smallest scales, making it painless to slip into a drawer or store on a counter. The Jennings scale also includes a 20-year manufacturer’s warranty. For about $30, the Jennings CJ4000 offers great value. Prima Coffee Equipment has also recommended the scale. A few customers have said that when weighing, the Jennings’s scale reads 0.5g higher, which can prove to be problematic in the beginning but can be overcome by subtracting that much from all readings. Also, losing your warranty card can be problematic in case your scale breaks, and you need it repaired. If you are on a budget, try the Ozeri Pronto Food Scale. This accurate yet easy to operate scale weighs up to 11 pounds in clear-cut calibrations of 1 gram (.05oz). It also boasts an enlarged weighing stage, which is elegantly finished with chrome, an auto-unit button that instantaneously converts from oz. to gms and lbs to kg and displays the results on the screen. Besides its rigorous quality specifications, this unit also features a precision tare button. The tare and unit buttons produce a click-sound, so you never have to guess if a function was selected when preparing meals in a hurry. The Pronto scale powers with 2AAA batteries guaranteed by the manufacturer’s one-year warranty. The Pronto kitchen scale works as specified by the manufacturer and you can have it for around $15. The only setback with this item is that it cannot handle large weights. In addition, the scale misses a backlit screen, which can make it a nuisance to see the results with a big bowl on the weighing platform.